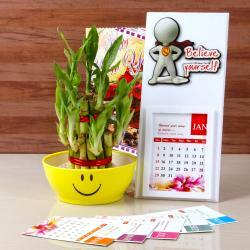 Product Consists : 2 Finest Roller Pens in a Box with New Year Diary Book and New Year Greeting Card. Give your loved ones a reason to celebrate New Year with ultimate fun by treating them to unique gifts from Giftacrossindia.com. 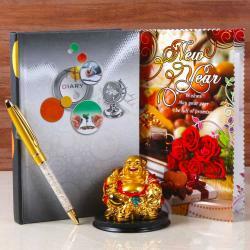 This New Year special gift hampers comprising with New Year Diary Book along with pair of designer ball pens. Imagine when your dear ones will use this, only thing they will remember is your beautiful gift. Let them cherish this beautiful gift for a lifetime. 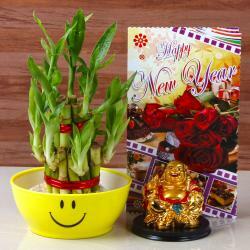 This hamper also includes New Year greeting card for send the best wishes for prosperous New Year. 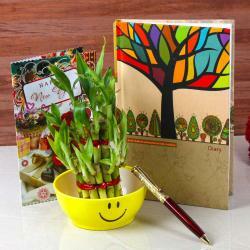 Product Includes: Two Finest Roller Pens in a Box with New Year Diary Book and New Year Greeting Card.